Wearing only a blue top and yellow pajama bottoms, Elvis was found crouched over with his face dark and bloated. 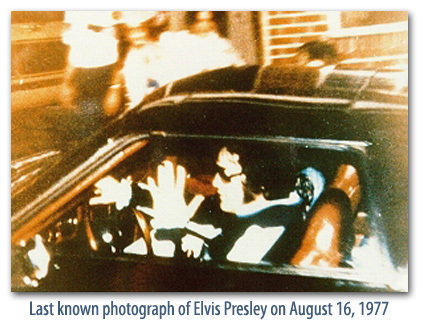 At approximately 3:30 p.m., Elvis Presley was pronounced dead after an extremely frantic ambulance ride to Baptist Memorial Hospital in Memphis. At the hospital, a throng of highly trained medical specialists battled to save his life but to no avail. The official medical verdict was death by heart failure. Officials from Baptist Memorial Hospital reached Vernon Presley by telephone to tell him that his son was dead. 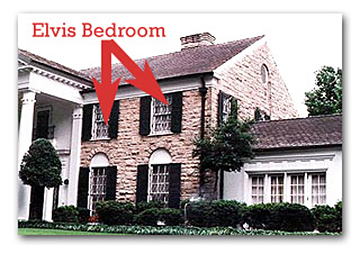 Half an hour later, on the famous steps of Graceland, a very grief-stricken Vernon Presley announced to the world: “My son, Elvis is dead.” Vernon Presley died two years later from a broken heart.